Shortly after the end of World War II, the U.S. Navy decided to carry out a series of atomic bomb tests on different kinds of ships. Bikini Atoll in the Central Pacific was chosen for these tests and the islanders were persuaded to move temporarily to another island group. They were assured of a safe return to their homes in due course. That return never happened. Short visits soon made it clear that the soils of their atoll carried extremely high levels of radiation. Bikini had become a wasteland, an environmental disaster. Bikini Atoll is one of a group of atolls that compose the Marshall Islands, a U.S. protectorate under the United Nations in the years following World War II. These islands are located about halfway between Hawaii and Australia and stretch over the Pacific Ocean for hundreds of thousands of square miles. Average temperature is over eighty degrees Fahrenheit and rainfall amounts to sixty inches annually. The first Europeans to reach the area were Spanish. That was more than three hundred years ago. For most of the succeeding 250 years there was little continuing contact with western nations. Trade in copra oil from coconuts was carried on but the islanders remained isolated, free to live in their closely integrated society, strengthened by extended family ties and local traditions. All this changed dramatically after World War I when Japan was mandated by the victorious nations to govern the islands. A military buildup began on Kwajalein Atoll, two hundred miles to the south of Bikini as this place became headquarters for Japan’s armed forces in the Marshall Islands. A watchtower was built to guard against possible invasions. This Atoll was still a fortified military position throughout World War II and was finally captured by U.S. forces in 1944 after a terrifying and costly conflict. After the war President Truman directed the U.S. Navy to investigate the effects of atomic bombs on U.S. warships. Bikini Atoll was chosen for this project for several reasons. It was located away from regular air and sea routes, had a good-sized lagoon, and close by there were a few large islands that could serve as observing stations. There was good access to the lagoon through wide channels and a shallow area a few miles away was a suitable site for anchoring the target ships. Kwajalein and Enewetak were close enough to serve as bases for aircraft. In February of 1946 the Bikinians, all 167 of them, were asked if they would be willing to leave temporarily so that the United States could begin testing atomic bombs. The U.S. governor assured them that this move would be for the good of mankind and to end all world wars. After much sorrowful deliberation King Juda, the Bikinian leader announced “We will go, believing that everything is in the hands of God.” The Bikinians were sent to Rongerik Atoll, 125 miles to the east, a place about one-sixth the size of Bikini and a location that was traditionally regarded by the Bikinians as unlivable because of inadequate resources of water and food. There was also a deeply-felt conviction that Rongerik was inhabited by evil spirits. The Bikinians were given food supplies for several weeks and then left to fend for themselves. Soon after these provisions ran out, the islander’s worst fears began to surface as they were unable to find adequate local food supplies of the kind they were accustomed to, coconuts and fish. A rash of serious illnesses late in 1946, perhaps due to lack of food, and a fire damaging a large number of coconut trees, reduced them to near starvation. They begged the Navy to let them return to Bikini. Instead they were moved to Ujelang Atoll early in 1947, but something went wrong with that plan and their odyssey took them to yet another group of islands, Kwajalein, where they were housed in tents on a strip of grass beside the airport. The reason for these migrations was always the same, the operational needs of the atomic bomb tests. The health and welfare of the islanders seemed to matter little. In 1948 there was another move and they left Kwajalein for the Island of Kili, far to the south of the Marshall Islands. While the islanders struggled to set up their new community on Kili, Bikini continued to be irradiated with a steady succession of bombs. The first two, each of the same power that had devastated the cities of Hiroshima and Nagasaki in 1945 just before the end of World War II, were detonated in the air. They were followed by more than twenty other blasts between the years 1946 and 1958, some on the ground, some above. In 1954, the new and vastly more dangerous hydrogen bomb, a thousand times more powerful than the one that destroyed Hiroshima (see Hiroshima, Japan, nuclear bomb), was detonated on the ground. Weather forecasting was very different in 1954 from what it is today. There were no satellites and no computers. Furthermore, little historical data was available for Bikini so it was very difficult to predict how winds might change in the short term. The enormous amount of planning and arranging that went into a bomb test, especially this new type, necessitated a decision some time ahead of the blast. Winds were favorable all day right up to eight hours before blast time, but then they changed. The test went forward in spite of the fact that radiation would inevitably blow in the direction of some inhabited islands. The site was the surface of the reef in the northwestern corner of Bikini Island. The area was illuminated by an expanding flash of blinding light. A raging fireball of intense heat measuring into the millions of degrees shot skyward at a rate of three hundred miles an hour. Within minutes the monstrous cloud, filled with nuclear debris, shot up more than twenty miles and generated winds at hundreds of miles per hour. These fiery gusts blasted the surrounding islands and stripped the branches and coconuts from the trees. On Bikini Island, millions of tons of sand, coral, plant, and sea life from Bikini’s reef and the surrounding lagoon waters were sent high into the air. The force of the explosion was far beyond the expectations of observing scientists. It was the most powerful bomb ever exploded by the United States. Fifty thousand square miles were contaminated. Ships which were stationed about forty miles east and south of Bikini, in positions enabling them to monitor the test, detected the eastward movement of the radioactive cloud from the fifteen megaton blast. They recorded a steady increase in radiation levels that became so high that all men were below decks and all hatches and watertight doors were sealed. One-and-a-half hours after the explosion, twenty-three fishermen aboard a Japanese fishing vessel, the Lucky Dragon, watched in awe as a “gritty white ash” began to fall on them. The men aboard the ship were oblivious to the fact that the ash was the fallout from a hydrogen bomb test. Shortly after being exposed to the fallout their skin began to itch and they experienced nausea and vomiting. One man died. On Rongelap Atoll—located about 125 miles east of Bikini—three to four hours after the blast, the same white, snow-like ash began to fall from the sky onto the sixty-four people living there. Not understanding what had happened they watched as two suns rose that morning, observed with amazement as the radioactive dust soon formed a layer on their island two inches deep turning the drinking water a brackish yellow. Children played in the fallout. Their mothers watched in horror as night came and they began to show the physical signs of exposure. There was severe vomiting along with diarrhea and hair falling out. The islanders fell into a state of terrified panic. Two days later they were finally taken to Kwajalein for medical treatment. About twelve years after the series of bomb tests was completed, U.S. government agencies began to consider returning the Bikinians to their homelands in compliance with the original promise in 1946. Specialists measured radiation levels on Bikini Atoll and it was considered safe. One report from the Atomic Energy Commission (AEC) went so far as to say, “Well water could be used safely by the natives upon their return to Bikini. It appears that radioactivity in the drinking water may be ignored from a radiological safety standpoint. The exposures of radiation that would result from the repatriation of the Bikini people do not offer a significant threat to their health and safety.” Accordingly, in June of 1968, the 540 Bikinians living on Kili and other islands returned to their homeland. For seven years there was little indication of any problem. The population of Bikini slowly increased. Then in 1975, during regular monitoring, radiological tests discovered higher levels of radioactivity than was originally thought. The U.S. Department of Interior officials stated that “Bikini appears to be questionable as to safety” and an additional report pointed out that some water wells on Bikini Island were also too contaminated with radioactivity for drinking. A couple of months later the AEC, on review of the scientists’ data, decided that the local foods grown on Bikini Island, i.e., pandanus, breadfruit, and coconut crabs, were also too radioactive for human consumption. Within a few months, after contemplating these new, terrifying, and confusing reports on the radiological condition of their atoll, the Bikinians filed a lawsuit in U.S. federal court demanding that a complete scientific survey of Bikini and the northern Marshalls be conducted. 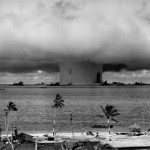 The lawsuit stated that the United States had used highly sophisticated and technical radiation detection equipment at Enewetak Atoll, but had refused to employ it at Bikini. More than three years of bureaucratic squabbles between the U.S. Departments of State, Interior and Energy over costs and responsibility for the survey, delayed any action on its implementation. The Bikinians, unaware of the severity of the radiological danger, remained on their contaminated island. In April of 1978 medical examinations performed by U.S. physicians revealed radiation levels in many of the 139 people on Bikini to be well above the U.S. maximum permissible level. The very next month, U.S. Interior Department officials described the 75 percent increase in radioactive cesium 137 as incredible. The Interior Department immediately announced plans to move the people from Bikini “within 75 to 90 days,” and so in September of that same year people were once again evacuated. The Bikinians saw their homeland again only once in 1988. They were brought back to witness the beginnings of a long-term project, the decontamination of the soils all around the lagoon. Some day, as yet unknown because of the enormity of the damage, that project might be completed so that a future generation of Bikinians can live there. After the people of Bikini were removed from their atoll for a second time, the U.S. government established a $6 million trust, The Hawaiian Trust Fund for the People of Bikini. A second grant of money, $20 million, was given to the Bikinians in 1982 to help them when they could return to their homeland. In 1997 there was a third grant, $90 million, this time for the cleanup of Bikini and Eneu, two of the group of islands known as Bikini Atoll. The total value of the fund by the year 2000 was $130 million. Ninety of the original 167 Bikinians, who left in 1946, were still alive at that time. In March of 1998 the International Atomic Energy Agency (IAEA) presented its final report on radiological conditions at Bikini Atoll. It concluded that, on the basis of the amount and quality of the information now available, no further testing is necessary. The Bikinians should not be allowed to return to their homeland of Bikini Island permanently, and eat locally grown food, until remedial measures are carried out. However, if the food consumed is imported, as is presently the case in a number of sites on the Atoll where fishing in the lagoon and diving-tourist enterprises on the big sunken ships are in operation, there are no dangers associated with temporary occupancy. The IAEA is quite sure that it is safe to walk on all of the Bikini islands. While the residual radioactivity is still too high for growing crops, it is not hazardous to health. The air, land surface, lagoon water, and the drinking water are all safe. There is no radiological risk in visiting the lagoon or the islands. The nuclear weapon tests have left practically no cesium in marine life. The cesium deposited in the lagoon was dispersed in the ocean long ago. The main radiation risk would be from the food. Eating locally grown produce, such as fruit, coconuts, and breadfruit would not be safe. One measure under consideration by the IAEA for ensuring the return of the islanders with freedom for them to eat locally grown food uses a potassium-based fertilizer. This would be spread on all areas of Bikini Island, not other islands of the Atoll, together with removal of soil beneath and around homes and replacing it with crushed coral. Because Bikini Island is extremely deficient in potassium, it has been found that plants will choose this when it is available rather than radiated minerals. The problem with this approach is its short life. It will work for four or five years only before repeated applications of the fertilizer are needed. The Bikinians are wary of any short-term measures. They have been badly hurt already by temporary arrangements, bringing them close to starvation. They favor the IAEA’s soil-scraping approach whereby the top fifteen inches of soil is removed. This would eliminate the danger of radiation but it would be environmentally costly. The fertile topsoil supports the tree crops which are a major local food resource. Nevertheless, the Bikinians continue to campaign for a soil-scraping approach for all twentythree islands of the Bikini Atoll. They would like to see it happen first on Bikini Island with the soil used to build a causeway to a neighboring island presently accessible only at low tide. The enormous ignorance that prevailed in 1946 about the dangers of radiation from atomic bombs created a lethal atmosphere around the Bikini test area. Some of the tragic effects of this were immediately evident but others came to light gradually over succeeding years. Hundreds of military personnel who were involved in the tests suffered from radiation diseases of various kinds. Today the dangers from radiation are well known and protective measures are in place. Of the more than two hundred ships that were brought to Bikini for the tests, ten of the biggest, including the former aircraft carrier USS Saratoga, still lie in the Bikini lagoon. They are uncontaminated now and serve as popular sites for diving tourism.